David Hume (April 26, 1711 - August 25, 1776) was a Scottish philosopher and historian. Hume was the third, the most radical and, in the eyes of many, the most important of the so-called British Empiricists, after the English John Locke and the Anglo-Irish George Berkeley. Along with Adam Smith and Thomas Reid, he was one of the most important representatives in the Scottish Enlightenment. Hume remains a towering figure in the history of philosophy and is perhaps the most significant English-speaking philosopher of all times. David Hume’s place in the history of philosophy is strongly associated with his advocacy of skepticism, though his was a “mitigated” form of skepticism, based on an empirical or natural approach and the respect of common sense. It was also Hume’s merit to stretch the line of thought of his predecessors to the breaking point and to offer a more consistent, though in many ways negative, view of things, rejecting what he considered to be false certainties. Immanuel Kant credited Hume with awakening him from his “dogmatic slumber” but opposed the conclusions of his skepticism. Still, the conviction that it is impossible for the human mind to make meaningful statements about that which transcends our senses has become part of Kant’s own system. It has also permanently influenced western thought in a way that is detrimental to religious inquiry of any kind. By stressing the superiority of the inductive method of empiricism over the deductive method of rationalism, Hume approaches cognition from the outside (experiences coming from the senses) rather than from the inside (the a priori constitution of the mind). This naturally leads to tentative conclusions at best (as Hume himself concedes) and easily to skepticism. Also, the unity of apperception (the oneness of the self) naturally comes to be rejected in favor of a bundle theory of the self, consisting in a mere aggregate of perceptions. Hume was born on April 26, 1711, in Edinburgh. From time to time throughout his life, he was to spend time at his family home at Ninewells by Chirnside, Berwickshire. His family sent him to the University of Edinburgh at the unusually early age of twelve. At first he considered a career in law, but came to have, in his words, "an insurmountable aversion to everything but the pursuits of Philosophy and general Learning." He had little respect for professors, telling a friend in 1735, "there is nothing to be learned from a Professor, which is not to be met with in Books." At the age of eighteen, in 1729, Hume made a philosophical discovery that opened up to him "a new scene of thought." He did not recount what this was, but it seems likely to have been his theory of causality—that our beliefs about cause and effect depend on sentiment, custom and habit, and not upon reason or abstract, timeless, general Laws of Nature. In 1734, after a few months in commerce in Bristol, he retreated to do self-study and conduct thought experiments on himself at La Fleche in Anjou, France. During his four years there, he laid out his life plan, as he wrote in My Own Life, resolving "to make a very rigid frugality supply my deficiency of fortune, to maintain unimpaired my independency, and to regard every object as contemptible except the improvements of my talents in literature." While there, he completed A Treatise of Human Nature at the age of 26. Although many scholars today consider the Treatise to be Hume's most important work and one of the most important books in the history of philosophy, the public did not at first agree. Hume himself described the (lack of) public reaction to the publication of the Treatise in 1739–1740 by writing that it "fell dead-born from the press, without reaching such distinction as even to excite a murmur among the zealots." After the publication of Essays Moral and Political, in 1744 he applied for the Chair of Ethics and Pneumatics (psychology) at Edinburgh University but was rejected. During the Jacobite Rebellion of 1745 he tutored the Marquise of Annandale. It was then that he started his great historical work, The History of Great Britain, which would take fifteen years and run to over a million words, to be published in six volumes in the period 1754 to 1762. In 1748 he served, in uniform, for three years as secretary to General St Clair. After deciding that the Treatise had problems of style rather than of content, he reworked some of the material for more popular consumption in Philosophical Essays concerning Human Understanding, later published as An Enquiry Concerning Human Understanding. It did not prove extremely successful eitherm but was better received than the Treatise. Hume was charged with heresy but he was defended by his young clerical friends who argued that as an atheist, he lay outside the jurisdiction of the Church. Despite his acquittal, and, possibly, due to the opposition of Thomas Reid of Aberdeen who, that year, launched a telling Christian critique of his metaphysics, Hume failed to gain the Chair of Philosophy at the University of Glasgow. It was in 1752, as he wrote in My Own Life, "the Faculty of Advocates chose me their Librarian, an office from which I received little or no emolument, but which gave me the command of a large library." It was this resource that enabled him to continue his historical research for his History. Hume achieved great literary fame as an essayist and historian. His enormous History of Great Britain was a bestseller in its day. In it, Hume presented politicians as creatures of habit, with a disposition to submit quietly to established government unless confronted by uncertain circumstances. In his view, only religious difference could deflect men from their everyday lives to think about political matters. Hume's early essay Of Superstition and Religion laid the foundations for nearly all-secular thinking about the history of religion. Critics of religion during Hume's time needed to express themselves cautiously. Less than 15 years before Hume was born, 18-year-old college student Thomas Aikenhead was put on trial for saying openly that he thought Christianity was nonsense, was convicted and hanged for blasphemy. Hume followed the common practice of expressing his views obliquely, through characters in dialogues. Hume did not acknowledge authorship of the Treatise until the year of his death, in 1776. His essays Of Suicide, and Of the Immortality of the Soul and his Dialogues Concerning Natural Religion were held from publication until after his death (published 1778 and 1779, respectively), and they still bore neither author's nor publisher's name. So masterful was Hume in disguising his own views that debate continues to this day over whether Hume was actually a deist or an atheist. Regardless, in his own time Hume's alleged atheism caused him to be passed over for many positions. 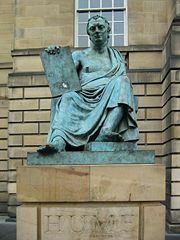 Statue of Hume in Edinburgh. From 1763 to 1765 Hume was Secretary to Lord Hertford in Paris, where he was admired by Voltaire and lionized by the ladies in society. He made friends with Rousseau, whom he later invited to England to protect him from persecution. Rousseau gratefully accepted the invitation but soon, due to his suspicious nature, he began to accuse his benefactor of secret ill motives. Hume wrote of his Paris life "I really wish often for the plain roughness of The Poker Club of Edinburgh . . . to correct and qualify so much luciousness." For a year from 1767, Hume held the appointment of Under Secretary of State for the Northern Department. In 1768 he settled in Edinburgh. Attention to Hume's philosophical works grew after the German philosopher Immanuel Kant credited Hume with awakening him from "dogmatic slumbers" (around 1770) and from then onwards he gained the recognition that he had craved all his life. James Boswell visited Hume a few weeks before his death at the age of 65. Hume told him that he sincerely believed it a "most unreasonable fancy" that there might be life after death. Hume wrote his own epitaph: "Born 1711, Died [----]. Leaving it to posterity to add the rest." It is engraved with the year of his death (1776) on the "simple Roman tomb" which he prescribed, and which stands, as he wished it, on the Eastern slope of the Calton Hill, Edinburgh, overlooking his home in the New Town of Edinburgh at No. 1 St David Street. In spite of his lifelong involvement in controversies surrounding his skepticism and his anti-religious views, as well as the often-repeated accusation of seeking literary fame through his unconventional statements, Hume is known to have been a sociable and unpretentious man of common sense, ready to open up to the views of others. Hume was heavily influenced by empiricists John Locke and George Berkeley, along with various Francophone writers such as Pierre Bayle, and various figures on the Anglophone intellectual landscape such as Isaac Newton, Samuel Clarke, Francis Hutcheson, and Joseph Butler. In spite of his reputation as the quintessential skeptic, Hume begins his considerations by refuting several forms of skepticism. Descartes’ methodic doubt is considered absurd, since we all in fact know about our existence. But, more importantly, the certainty Descartes thought to arrive at through his method is challenged as illusory. If humankind were really subjected to the kind of doubt Descartes tries to overcome by his cogito ergo sum, our condition would be incurable. Arriving at certainty though strict reasoning based on an original principle, in Hume’s eyes, is pure fallacy. Still, Hume admits that the Cartesian method is valid to the extent that it chooses to proceed by small, captious steps, with constant reference to experience. Next, Hume rejects the kind of skepticism that implies the “absolute fallaciousness of [our] mental faculties.” It is clear, he says, that when the testimony of our senses is doubted it is usually the false interpretation of our reasoning that is to be blamed. In particular, in reference to Berkeley, Hume discards as laughable the denial of the reality of the external world. However, for “more profound research,” notably concerning everything that is beyond the immediate testimony of our senses, philosophical doubt has its place. Hume’s advocacy of mitigated skepticism precisely touches the point that would so strongly influence Immanuel Kant: we cannot possibly apply our mind to those areas of inquiry that our outside or beyond “the narrow capacity of human understanding.” Though Kant would eventually reject Hume’s skeptical conclusions, while accepting his starting point, he would retain much of his skepticism on matters such as God and the eternal life. By the term impression, then, I mean all our more lively perceptions, when we hear, or see, or feel, or love, or hate, or desire, or will. And impressions are distinguished from ideas, which are the less lively perceptions, of which we are conscious, when we reflect on any of those sensations or movements above mentioned. It seems a proposition, which will not admit of much dispute, that all our ideas are nothing but copies of our impressions, or, in other words, that it is impossible for us to think of anything, which we have not antecedently felt, either by our external or internal senses. This forms an important aspect of Hume's skepticism, for he says that we cannot be certain a thing, such as God, a soul, or a self, exists unless we can point out the impression from which the idea of the thing is derived. Hume held that one cannot actually say that one event caused another. All one knows for sure is that one event is correlated to another. For this Hume coined the term 'constant conjunction.’ That is, when we see that one event always 'causes' another, what we are really seeing is that one event has always been 'constantly conjoined' to the other. As a consequence, we have no reason to believe that one caused the other, or that they will continue to be 'constantly conjoined' in the future (Popkin & Stroll 1993, 268). The reason we do believe in cause and effect is not because cause and effect are the actual way of nature; we believe because of the psychological habits of human nature (272). Such a lean conception robs causation of all its force, and some later Humeans like Bertrand Russell have dismissed the notion of causation altogether as something akin to superstition. But this defies common sense, thereby creating the problem of causation: what justifies our belief in a causal connection and what kind of connection can we have knowledge of? Kant would try to solve the problem by stating that the principle of cause and effect is a fundamental law of our mind’s functioning, though we are not entitled to say that it applies to things themselves. Hume held that we have an instinctive belief in causation based on the development of habits in our nervous system, a belief that we cannot eliminate, but which we cannot prove true through any argument, deductive or inductive, just as is the case with regard to our belief in the reality of the external world. In Enquiry Concerning Human Understanding (EHU), §4.1.20-27, §4.2.28-33., Hume articulated his view that all human reasoning is of two kinds, Relation of Ideas and Matters of Fact. While the former involves abstract concepts like mathematics where deductive certitude presides, the latter involves empirical experience about which all thought is inductive. Now, since according to Hume we can know nothing about nature prior to its experience, even a rational man with no experience "could not have inferred from the fluidity and transparency of water that it would suffocate him, or from the light and warmth of fire that it would consume him." (EHU, 4.1.6) Thus, all we can say, think, or predict about nature must come from prior experience, which lays the foundation for the necessity of induction. The first justification states that, as a matter of logical necessity, the future must resemble the past. But, Hume pointed out, we can conceive of a chaotic, erratic world where the future has nothing to do with the past—or, more tamely, a world just like ours right up until the present, at which point things change completely. So nothing makes the principle of induction logically necessary. The second justification, more modestly, appeals to the past success of induction—it has worked most often in the past, so it will probably continue to work most often in the future. But, as Hume notes, this justification uses circular reasoning in attempting to justify induction by merely reiterating it, bringing us back where we started. The noted twentieth century theoretician and philosopher Bertrand Russell confirmed and elaborated Hume's analysis of the problem in his work, The Problems of Philosophy, chapter 6. We tend to think that we are the same person we were five years ago. Though we've changed in many respects, the same person appears present as was present then. We might start thinking about which features can be changed without changing the underlying self. Hume, however, denies that there is a distinction between the various features of a person and the mysterious self that supposedly bears those features. After all, Hume pointed out, when you start introspecting, you notice a bunch of thoughts and feelings and perceptions and such, but you never perceive any substance you could call "the self." So as far as we can tell, Hume concludes, there is nothing to the self over and above a big, fleeting bundle of perceptions. Note in particular that, on Hume's view, these perceptions do not belong to anything. Rather, Hume compares the soul to a commonwealth, which retains its identity not by virtue of some enduring core substance, but by being composed of many different, related, and yet constantly changing elements. The question of personal identity then becomes a matter of characterizing the loose cohesion of one's personal experience (note that in the Appendix to the Treatise, Hume said mysteriously that he was dissatisfied with his account of the self, and yet he never returned to the issue). Most of us find some behaviors more reasonable than others. Eating aluminum foil, for example, seems to have something unreasonable about it. But Hume denied that reason has any important role in motivating or discouraging behavior. After all, reason is just a sort of calculator of concepts and experience. What ultimately matters, Hume said, is how we feel about the behavior. His work is now associated with the doctrine of instrumentalism, which states that an action is reasonable if and only if it serves the agent's goals and desires, whatever they be. Reason can enter the picture only as a servant, informing the agent of useful facts concerning which actions will serve his goals and desires, but never deigning to tell the agent which goals and desires he should have. So, if you want to eat aluminum foil, reason will tell you where to find the stuff, and there's nothing unreasonable about eating it or even wanting to do so (unless, of course, one has a stronger desire for health or the appearance of sensibility). Hume's approach is fundamentally an empirical one. Instead of telling us how morality ought to operate, he purports to tell us how we do actually make moral judgments. He comes to the conclusion that most if not all of the behaviors we approve of increase public utility. Does this then mean that we make moral judgments on self-interest alone? Unlike his fellow empiricist Thomas Hobbes, Hume argues that this is not in fact the case. In addition to considerations of self-interest, he asserts, we are swayed by our sympathies for our fellow men. Hume also defends this sentiment-based theory of morality by claiming that we could never make moral judgments based on reason alone. He first claims that moral beliefs are intrinsically motivating—if you believe killing is wrong, you will automatically be motivated not to kill and to criticize killing and so on (moral internalism). He then reminds us that reason alone can motivate nothing—reason discovers matters of fact and logic, and it depends on our desires and preferences whether apprehension of those truths will motivate us. Consequently, reason alone cannot yield moral beliefs. This argument against founding morality on reason is now one in the stable of moral anti-realist arguments. As Humean philosopher John Mackie put it, for sheer facts about the world to be intrinsically motivating as far as morality goes, they would have to be very weird facts. Thus we have every reason not to believe in them. For relevant contemporary work, see Mackie's works, Ethics: Inventing Right and Wrong or Hume's Moral Theory. Just about everyone has noticed the apparent conflict between free will and determinism—if your actions were determined to happen billions of years ago, then how can they be up to you? But Hume noted another conflict, one that turned the problem of free will into a full-fledged dilemma: free will is incompatible with indeterminism. Imagine that your actions are not determined by what events came before. Then your actions are, it seems, completely random. Moreover, and most importantly for Hume, they are not determined by your character—your desires, your preferences, your values, etc. How can we hold someone responsible for an action that did not result from his character? How can we hold someone responsible for an action that randomly occurred? Free will seems to require determinism, because otherwise, the agent and the action wouldn't be connected in the way required of freely chosen actions. So now, nearly everyone believes in free will, free will seems inconsistent with determinism, and free will seems to require determinism. Hume's view is that human behavior, like everything else, is caused, and therefore holding people responsible for their actions should focus on rewarding them or punishing them in such a way that they will try to do what is morally desirable and will try to avoid doing what is morally reprehensible (see also compatibilism). Kant would later attempt to reconcile the determinism of nature and the apparent free choice of our moral actions. Hume noted that many writers talk about what ought to be on the basis of statements about what is (is-ought problem). But there seems to be a big difference between descriptive statements (what is) and prescriptive statements (what ought to be). Hume calls for writers to be on their guard against changing the subject in this way without giving an explanation of how the ought-statements are supposed to follow from the is-statements. But how exactly can you derive an 'ought' from an 'is'? That question has become one of the central questions of ethical theory, and Hume is usually assigned the position that such a derivation is impossible. Hume is probably one of the first writers to make the distinction between normative (what ought to be) and positive (what is) statements, which is so prevalent in social science and moral philosophy. G. E. Moore defended a similar position with his "open question argument," intending to refute any identification of moral properties with natural properties—the so-called "naturalistic fallacy." It was probably Hume who, along with his fellow members of the Scottish Enlightenment, first advanced the idea that the explanation of moral principles is to be sought in the utility they tend to promote. Hume's role is not to be overstated, of course; it was his countryman Francis Hutcheson who coined the utilitarian slogan "greatest happiness for the greatest numbers." But it was from reading Hume's Treatise that Jeremy Bentham first felt the force of a utilitarian system: he "felt as if scales had fallen from [his] eyes." Nevertheless, Hume's proto-utilitarianism is a peculiar one. He doesn't think that the aggregation of cardinal units of utility provides a formula for arriving at moral truth. On the contrary, Hume was a moral sentimentalist and, as such, thought that moral principles could not be intellectually justified. Some principles simply appeal to us and others don't; and the reason why utilitarian moral principles do appeal to us is that they promote our interests and those of our fellows, with whom we sympathize. Humans are hard-wired to approve of things that help society—public utility, for example. Hume used this insight to explain how we evaluate a wide array of phenomena, ranging from social institutions and government policies to character traits and talents. For Hume, the only way to support theistic religion beyond strict fideism is by an appeal to miracles. But Hume argued that, at minimum, miracles could never give religion much support. There are several arguments suggested by Hume's essay, all of which turn on his conception of a miracle: namely, a violation of the laws of nature. His very definition of miracles from his Enquiry Concerning Human Understanding states that miracles are violations of the laws of nature and consequently have a very low probability of occurring. In short, extraordinary claims require extraordinary evidence. Critics have argued that such a dictum assumes the character of miracles and natural laws prior to any specific examination of miracle claims, and thus amounts to a subtle form of begging the question. They have also noted that it requires an appeal to inductive inference, as none have observed every part of nature or examined every possible miracle claim (e.g., those yet future to the observer), which in Hume's philosophy was especially problematic (see above). Another claim is his argument that human testimony could never be reliable enough to countermand the evidence we have for the laws of nature. This point on miracles has been most applied to the question of the resurrection of Jesus, where Hume would no doubt ask, "Which is more likely – that a man rose from the dead or that this testimony is mistaken in some way?" Or, in a more contemporary setting, "Which is more likely – that Uri Geller can really bend spoons with his mind or that there is some trick going on?" This is somewhat similar to Ockham's Razor. This argument is the backbone of the skeptic's movement and a live issue for historians of religion. Furthermore, the design argument is based on an incomplete analogy: because of our experience with objects, we can recognize human-designed ones, comparing for example a pile of stones and a brick wall. But in order to point to a designed Universe, we would need to have an experience of a range of different universes. As we only experience one, the analogy cannot be applied. Often, what appears to be purpose, where it looks like object X has feature F in order to secure some outcome O, is better explained by a filtering process: that is, object X wouldn't be around did it not possess feature F, and outcome O is only interesting to us as a human projection of goals onto nature. This mechanical explanation of teleology anticipated natural selection (see also Anthropic principle). The universe is far from perfect. If anything, many of its features seem to prove poor design. For relevant contemporary work, see J. C. A. Gaskin's Hume's Philosophy of Religion, and Richard Swinburne's The Existence of God. 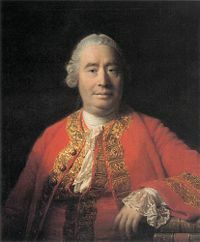 Many regard David Hume as a political conservative, sometimes calling him the first conservative philosopher. He expressed suspicion of attempts to reform society in ways that departed from long-established custom, and he counseled people not to resist their governments except in cases of the most egregious tyranny. However, he resisted aligning himself with either of Britain's two political parties, the Whigs and the Tories, and he believed that we should try to balance our demands for liberty with the need for strong authority, without sacrificing either. He supported liberty of the press, and was sympathetic to democracy, when suitably constrained. It has been argued that he was a major inspiration for James Madison's writings, and the Federalist No. 10 in particular. He was also, in general, an optimist about social progress, believing that, thanks to the economic development that comes with the expansion of trade, societies progress from a state of "barbarism" to one of "civilization." Civilized societies are open, peaceful and sociable, and their citizens are as a result much happier. It is therefore not fair to characterize him as favoring "that stagnation which is the natural ideal of a skeptic" (Stephen 185). Although strongly pragmatic, Hume produced an essay titled Idea of a Perfect Commonwealth, where he detailed what any reforms should seek to achieve. Strong features for the time included a strict separation of powers, decentralization, extending the franchise to anyone who held property of value and limiting the power of the clergy. The Swiss militia system was proposed as the best form of protection. Elections were to take place on an annual basis and representatives were to be unpaid, which was aimed at keeping the interests of constituents in the minds of politicians. For more, see Douglas Adair's "That Politics May Be Reduced to a Science: David Hume, James Madison and the Tenth Federalist" in Fame and the Founding Fathers; Donald W Livingston, Hume's Philosophy of Common Life; John B Stewart, Opinion and Reform in Hume's Political Philosophy; Bradley C. S. Watson, "Hume, Historical Inheritance, and the Problem of Founding" in The American Founding and the Social Compact. Hume's idea on private property is special—private property was not a natural right, but is justified since it is a limited good. If all goods were unlimited and available freely, then private property would not be justified. Hume also believed in unequal distribution of property, since perfect equality would destroy the ideas of thrift and industry, which leads to impoverishment. Hume considered foreign trade a stimulus for a country’s economic growth. He was among the first to develop automatic price-specie flow, an idea that contrasts with the mercantile system. Simply put, when a country increases its in-flow of gold, this in-flow of gold will result in price inflation, and then price inflation will force out countries from trading that would have traded before the inflation. This results in a decrease of the in-flow of gold in the long run. Hume also proposed a theory of beneficial inflation. He believed that increasing the money supply would raise production in the short run. This phenomenon was caused by a gap between the increase in the money supply and that of the price level. The result is that prices will not rise at first and may not rise at all. This theory is reminiscent of that later developed by John Maynard Keynes. The economic views of Hume’s Political Discourses are believed to have influenced such thinkers as Adam Smith and Thomas Malthus. I am apt to suspect the negroes and in general all the other species of men … to be naturally inferior to the whites. There never was a civilized nation of any other complexion than white, nor even any individual eminent either in action or speculation. … Such a uniform and constant difference could not happen, in so many countries and ages, if nature had not made an original distinction betwixt these breeds of men. The blatant racism of Hume's statement is striking, but of little significance in itself, since that sort of racist thinking was a widespread feature of European culture in his time. The interest of this statement lies in the fact that it can serve as a case study for his theory of knowledge. The idea of an inborn equality of all human beings is denied by him, based on available practical evidence, and the inductive method is used without taking into account elements such as the temporary influence of social circumstances. In agreement with Hume’s own skepticism, the inductive method thus fails in its conclusions. Historians most famously see Humean philosophy as a thoroughgoing form of skepticism, but many commentators have argued that the element of naturalism has no less importance in Hume's philosophy. Hume scholarship has tended to oscillate over time between those who emphasize the skeptical side of Hume (such as the logical positivists), and those who emphasize the naturalist side (such as Don Garrett, Norman Kemp Smith, Kerri Skinner, Barry Stroud, and Galen Strawson). Both Bertrand Russell (1946) and Leszek Kołakowski (1968) saw Hume as a positivist holding the view that true knowledge derives only from the experience of events, from “impressions on the senses” or (later) from “sense data” and that knowledge otherwise obtained was “meaningless.” Einstein (1915) wrote that he was inspired by Hume's positivism when formulating his Special Theory of Relativity. Edmund Husserl (1970) saw the phenomenologist in Hume when he showed that some perceptions are interrelated or associated to form other perceptions which are then projected onto a world putatively outside the mind. Hume was called “the prophet of the Wittgensteinian revolution” by Phillipson (1989), referring to his view that mathematics and logic are closed systems, disguised tautologies, and have no relation to the world of experience. Perhaps the best summary of Hume’s philosophy is offered by Norton (1993) who asserted that Hume was "the first post-skeptical philosopher of the early modern period." Hume challenged the certainty of the Cartesians and other rationalists who attempted to refute philosophical skepticisms, and yet himself undertook the project of articulating a new science of human nature that would provide a defensible foundation for all other sciences, including the moral and political. Hume called himself a "mitigated" skeptic (EHU 162; his own emphasis). A Kind of History of My Life (1734) Ms National Library of Scotland. Sometimes attributed to Adam Smith but now generally believed to be an attempt by Hume to popularize his Treatise. A collection of pieces written over many years and published in a series of volumes before being gathered together into one near the end of Hume's life. The essays are dizzying and even bewildering in the breadth of topics they address. They range freely over questions of aesthetic judgment, the nature of the British government, love, marriage and polygamy, and the demographics of ancient Greece and Rome, to name just a few of the topics considered. However, certain important topics and themes recur, especially the question of what constitutes "refinement" in matters of taste, manners, and morals. The Essays are written in clear imitation of Joseph Addison's Tatler and The Spectator, which Hume read avidly in his youth. Included in Essays and Treatises on Several Subjects (1753-1756), reprinted 1758 - 1777. This forms more a category of books than a single work, a monumental history spanning "from the invasion of Julius Caesar to the Revolution of 1688." This work brought Hume the most fame during his own lifetime, going through over 100 editions. Many considered it the standard history of England until the publication of Thomas Macaulay's own monumental History of England. Penned in April, shortly before his death, this autobiography was intended for inclusion in a new edition of "Essays and Treatises on Several Subjects." Published posthumously by his nephew, David Hume, the Younger. Being a discussion among three fictional characters concerning arguments for the existence of God, most importantly the argument from design. Anderson, R. F. 1966. Hume’s First Principles. Lincoln, NE: University of Nebraska Press. Ayer, A. J. 1936. Language, Truth and Logic. London. Braham, Ernest G. 1987. The Life of David Hume - the terrible David. J. Martin Stafford, Altringham. Einstein, A. 1915. “Letter to Moriz Schlick.” B. Schwarzschild (trans. & ed.). In The Collected Papers of Albert Einstein vol. 8A, R. Schulmann, A. J. Fox, J. Illy, (eds.). Princeton, NJ: Princeton University Press, 1998: p. 220. Fogelin, R. J. 1993. Hume’s Scepticism. In D. F. Norton (ed.). 1993. The Cambridge Companion to Hume. Cambridge University Press, pp. 90-116. Hume, David. 1740. A Treatise of Human Nature. 1967 edition. Oxford: Oxford University Press. Hume, David. 1777. An Enquiry concerning Human Understanding. P. N. Nidditch (ed.). 3rd edition, 1975. Oxford: Clarendon Press. Norton, D. F. 1993. Introduction to Hume’s thought. In D. F. Norton (ed. ), 1993. The Cambridge Companion to Hume. Cambridge: Cambridge University Press. pp. 1-32. Penelhum, T. 1993. Hume’s Moral Philosophy. In D. F. Norton (ed. ), 1993. The Cambridge Companion to Hume, Cambridge: Cambridge University Press. pp. 117-147. Popkin, R. & A. Stroll. 1993. Philosophy. Oxford: Reed Educational and Professional Publishing Ltd.
Popper. K. 1960. Knowledge without authority. In D. Miller (ed. ), 1983. Popper. Oxford, Fontana. pp. 46-57. Robinson, Dave & Judy Groves. 2003. Introducing Political Philosophy. Icon Books. ISBN 184046450X. Russell, B. 1946. A History of Western Philosophy. London, Allen and Unwin. Stephen, Leslie. 1876. History of English Thought in the Eighteenth Century. 2 vols. London: Smith, Elder and Co.
Taylor, A. E. 1927. “David Hume and the Miraculous.” Leslie Stephen Lecture. Cambridge, pp. 53-4. All links retrieved November 10, 22017. David Hume: Resources on Hume, including books, articles, and encyclopedia entries.